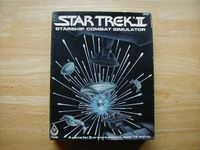 In this section of the Star Trek II, Starship Combat Simulator, you are in direct command of an array of starships facing a deadly, spaceborne enemy. You must use your forces to best advantage against your opponent. Fleets from all of the galactic superpowers of the Star Trek universe are at your disposal for simulating space battles in preparation for the always-present possibility of war. Starship Tactics is designed for two or more commanders controlling from one ship each to the entire fleets. Included in this box are the basic rules for beginning play, the advanced rules to expand play with more option and finally the expert rules for more detailed play. This section of the game, Star Trek II, Starship Combat Simulator puts you directly in the role of a sharship officer on the bridge during a combat simulation run. Using your control panel you have an instant readout on the functions of your part of the ship and can effect changes in systems status - all under the direction of the captain. For the player in the Captain seat there is not control panel - just the awesome responsibility of giving orders and directing the ship's fate. Command & Control is played by 3 to 6 players (serving as the starship bridge crew), plus an 'instructor' who sets up and monitors the situation while controlling the opposing vessels.